It’s no secret I love a good Mum lunch. Packing my lunches for work saves me a LOT of money. But that is not the only benefit. I definitely eat much healthier than if I was buying my lunch. But, I know just how tempting it is to buy lunches. Especially if the lunch that has been packed is not so appetising. So I think the key is to keep lunches fresh and appealing to eat. So you actually want to eat it! 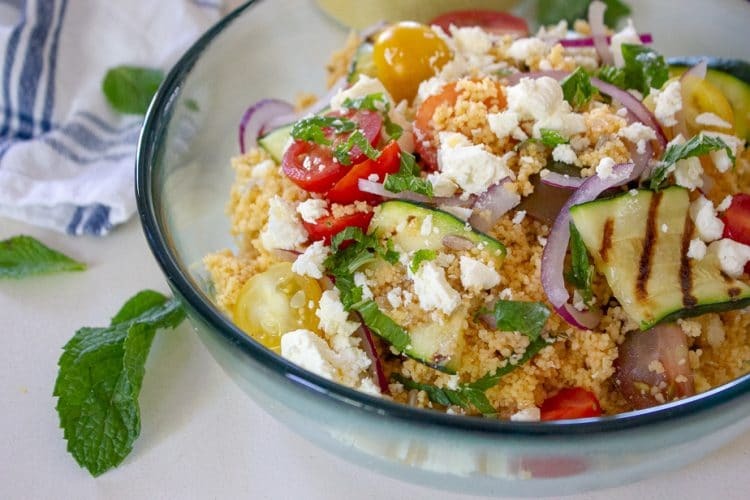 And this is just one of the reasons why I love this recipe for Vegetable and Spiced Cous Cous Salad. It’s just so colourful and appealing to the eye. Not to mention the taste buds! 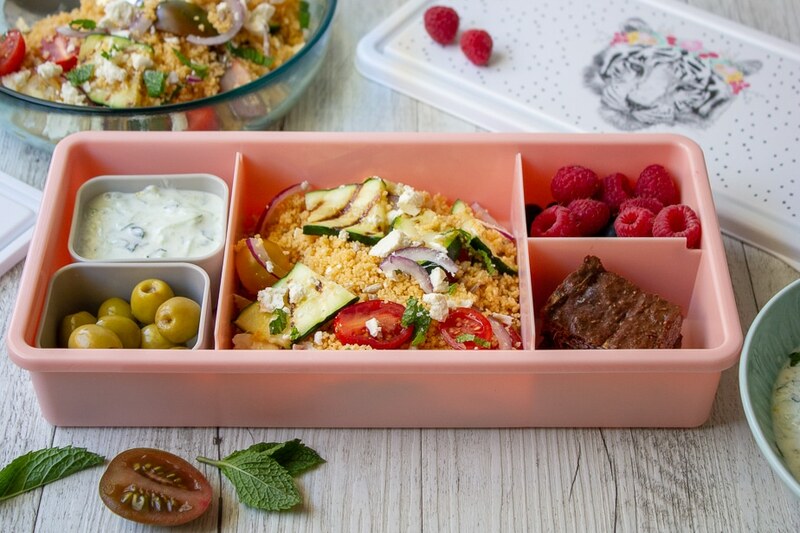 My lunchbox is packed for work with spiced cous cous salad, tzatziki, olives, mixed berries, Healthier Chocolate Brownie. I started buying these little flavoured Cous Cous satchels from the supermarket recently for my lunches and to have as a side with dinners. While the sachets were actually pretty low in salt and sugar, they were pretty expensive for what was just a bit of extra flavouring. Also, not to mention all that unnecessary packaging. So I decided to develop my own recipe. I spiced this Cous Cous with ground cumin, ground coriander, smoked paprika and fennel seeds and it is a delicious combination. 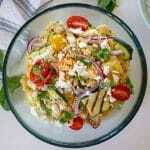 I love this Vegetable and Spiced Cous Cous salad served with a Tzatziki dip. And while you can have the salad without it, the Tzatziki is such a good accompaniment. And it is really easy to make. I make Tzatziki often to have with dinners or as a dipper for the kids to have with veggies for a delicious snack. If you are looking for other mum lunch ideas why not try these delicious Roasted Vegetable Pita Pockets or my Roasted Pumpkin and Feta Muffins. 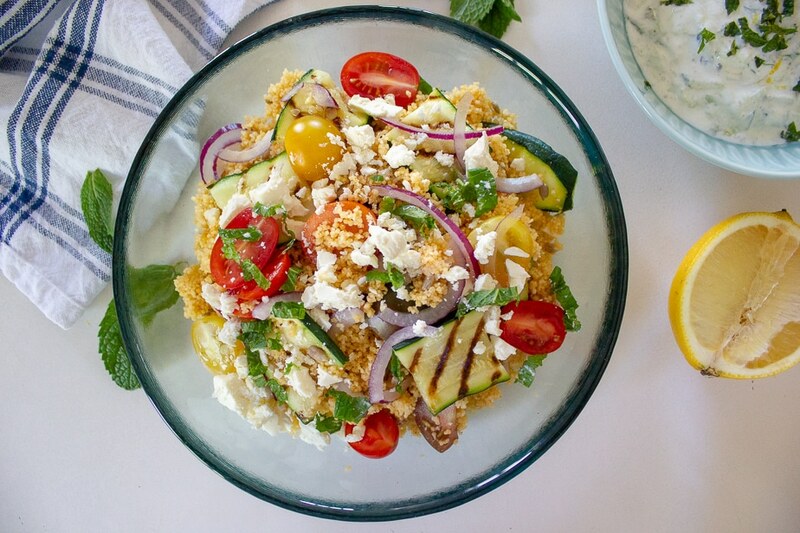 You won’t want to buy lunches when you can have this delicious Vegetable and Spiced Cous Cous Salad. It is fantastic for a packed work lunch or as a side dish with dinner. Quick and easy to make and packed with goodness. Mix in spices and salt and make Cous Cous according to package instructions (don’t add any additional salt if included as per packet instructions). Set aside. On a lightly oiled griddle pan over medium heat fry the zucchini on both sides until just cooked through. If you don’t have a griddle pan, use a normal frypan. Meanwhile in a small bowl mix together the yogurt, cucumber, mint, lemon juice and zest, garlic, salt and pepper to make the tzatziki. Cover and refrigerate. When the zucchini has cooked, cut into bite sized pieces. 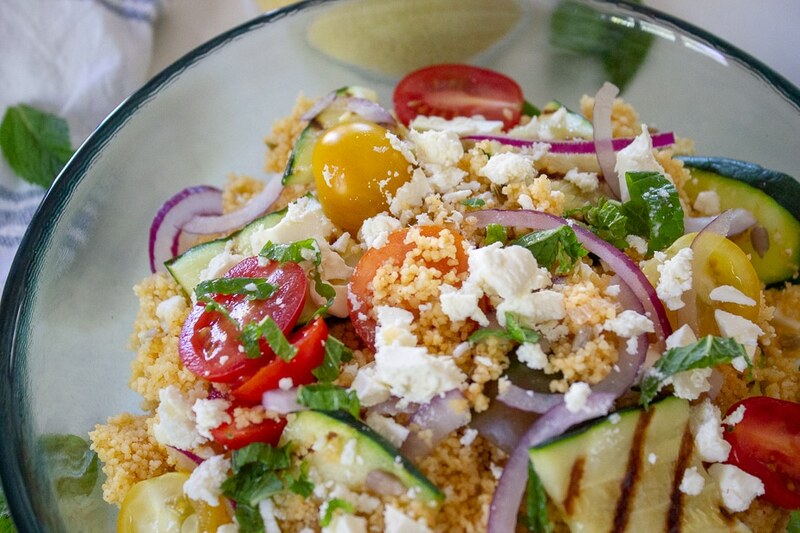 Add to the Cous Cous the zucchini, tomatoes, onion, feta, sunflower seeds and mint and mix through. 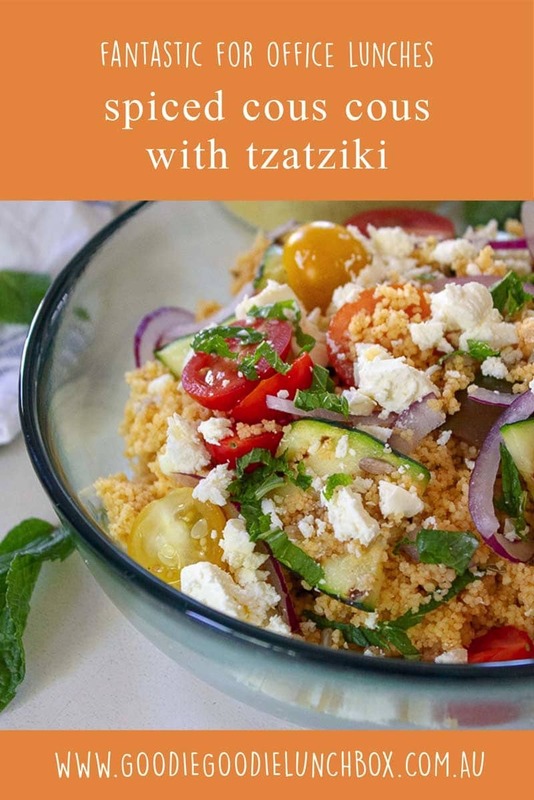 I hope you enjoy this delicious Vegetable and Spiced Cous Cous Salad and the yummy tzatziki dip. If you make this, remember to share a pic with me over on Instagram or Facebook.